Radiant floor heating is a comfortable and efficient form of heating where warm water circulates through specially designed tubing (PEX) installed under the floor. The heat radiates evenly up through the floor warming people and objects in the room and providing more comfort for less money. 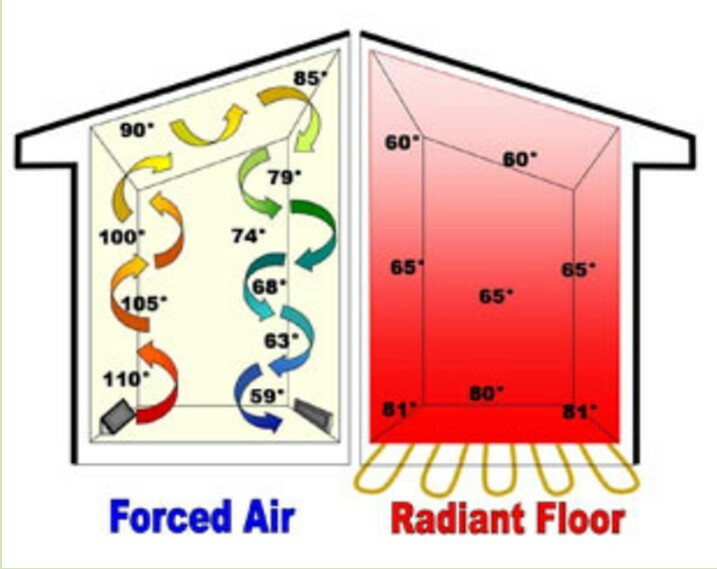 Radiant Heat can be placed in all floors and ventilation ducts are design for any future air conditioner. Along with client input Greenlife takes specical consideration and planning the multi zones for comfortable heating living. Greenlife can offer an optional internet and smart phone access to control zones. Forthcoming Solar Greenlife plans for the future by installing a rough in chase for a solar system in each home. The roof is designed for future support of the solar panels. The in tial mechanical room is designed and sized for future radiant storage and equipment requirements. Greenlife can offer an optional internet and smart phone access to control zones. Contact us today for more in-depth information.